Happy Friday, everyone! We hope you all have a lovely weekend planned, and let’s start it out right with a giveaway. One lucky winner will receive the just released Fiskars Ruler Connector Set! 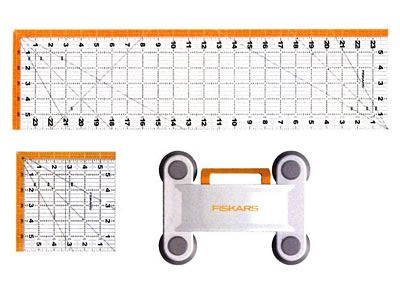 The Fiskars Ruler Connector Set includes a Fiskars Ruler Connector, 6 x 6 inch ruler & 6 x 24 inch ruler. The Ruler Connector bridges and holds together two rulers for accurate, longer cuts. The retractable alignment guide helps line up rulers and folds out of the way, to allow cutting on all sides. Question of the week: If you could go only to one restaurant for the next five years, which would it be? This entry was posted in Crafts and tagged Free Stuff Friday!! on April 13, 2018 by Kimberly. If I could go to only one restaurant it would’ve Blue Kemon. A Utah local favorite. Fresh and yum! So good! I would choose a Ruby Tuesday because of their great salad bar and burgers. My whole family enjoys going there. THat is a tough question! I would go to a local restaurant – Reds at Thousand Oaks – because they have everything from salad to pizza to brussel spouts! Since I’m a big fan of variety, I’d have to choose the buffet-style Sicily’s Pizza. Pasta,salad, fried foods, soups, pizza, desserts, the works! Let the grazing begin. Fogo de Chao! They have lots of different meats that they bring around to you as well as there is the salad bar with cheeses, fruits, salad, soups…. almost everything you could want to eat is available and all high quality. Best of all is it’s all you can eat so you never will leave hungry. Any good quality sushi restaurant! If I could go to one restaurant, it would have to be Golden Corral. They have really good food and plenty of selections. But, my main reason for this restaurant is not the food. It is because of the memories, my Mother would take us there. I lost my Mother in March so I would go there to remember the family time we all shared there with her. Having just tried a local restaurant, Nosh, last night, I would say that would be a good choice…as long as I don’t have to pay every time. It’s on the expensive side! Rain Cafe because it affordable, menu with a variety of foods and taste food..
Swiss Chalet. I love their salads and chicken. If I could only go to one restaurant for the next 5 years I would choose Outback! I love their brown bread and butter, Bloomin’ Onions and their steaks are to die for! Only go to one restaurant for the next 5 years I would choose Panda Express I love the eggplant and tofu my favorite I could eat it every day. I would have to say Olive Garden. You can mix match so many different ways, it would take a long time to get old, at least to me. And never ending bread sticks!!! Hard to say -there are two local restaurants we go to here (small town USA). One is a deli/restaurant in a gas station (very common here). We’ve been going there for 3 years, every Thursday. They treat us like family, we treat them like family. BTW, we love their food too! The other one has a FANTASTIC salad bar. The food is pretty typical home cooking, but the salad bar is so good! Oh my!! I would eat at a steakhouse because they offer chicken, fish and of course, steak! Let’s not forget about their fabulous salad options. That is a tough choice! I think I would choose Peppinos. It’s a local restaurant with a great variety, and really good pizza. Thank you for the chance to win! Camino Real. I love mexican food especially their rice and beans. I would go to The Keg. I love their menu and the quality of the food and their Billy Miner Pie is a must have dessert! Tough question! Since I like a variety of foods, I think I would pick some kind of buffet like Golden Corral. Yes, Golden Corral would be the best choice. So many choices. Satisfy cravings! Absolutely! Yes, Golden Corral would be the best choice. So many choices. Satisfy cravings! Ugh! I need variety! And affordability. This question is too hard. I guess I would go with Puccini because they have pastas, chicken dishes, pizza and hoagies and great salads. Variety! Golden Corral – The variety is amazing. Difficult choice, but I would choose local Athens Family Restaurant because they serve all 3 meals and they have breakfast all day.